Not really my style, but you can’t beat free! I figured we’d slap some primer and paint on it so it wouldn’t stick out like a sore thumb, and all would be happy in our dining room. Problem was, it was missing the sink bowl. And since the hole was oval, replacing the bowl was near to impossible. I tried reaching out to the manufacturer (outside of the US) or sales people (in the US) and had no luck. I sent the dimensions of the hole to my mom who looked all over for a Tupperware or metal or some other bowl that would fit the hole. No luck. Finally, I realized that it wasn’t going to be as easy as placing something inside the existing space and that I was either going to have to attach something underneath or change the shape of the hole, which led me to googling images of play kitchens that people had built. There are some really, really amazing play kitchens out there. But the second I saw this one, with an apron front sink, I knew that’s what I wanted to do. And not only did I want to fix the sink problem, I also wanted to add storage space and decorations to make it more country/vintage looking. I drew a picture, and I talked to my friend Tiago, who is a carpenter, to see if he could help me cut the wood. I posted a “wanted” on the REX for scrap wood and, when I had found enough, we planned for an afternoon of carpentry. I figured we would get everything cut and then I would figure out how to put it all together later. Tiago was amazing. Not only did he cut everything, but he also put the entire thing together perfectly. He measured and remeasured, did all kinds of fancy things like adding shims and using finishing nails — things that I never would have been able to do, certainly not as quickly. He managed to make two small pieces of bead board look like one. 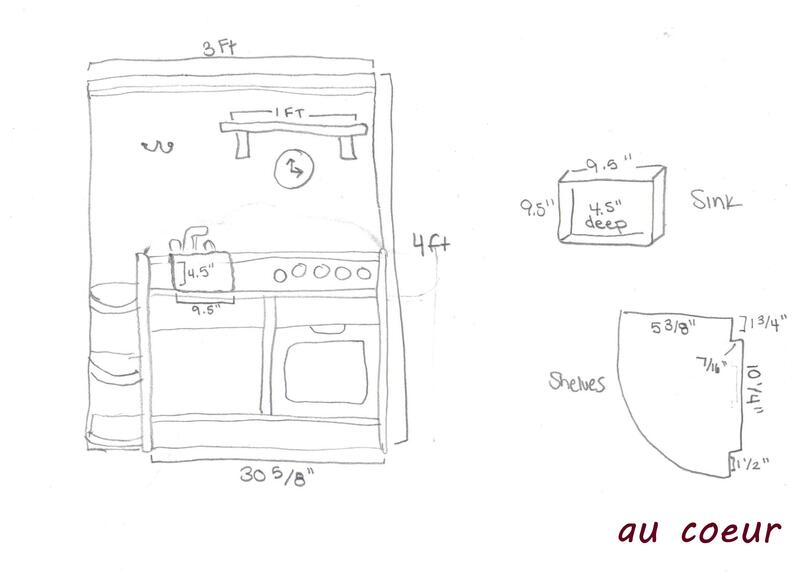 Tiago turned my simple sketch into reality: This play kitchen is a work of art; right down to the apron front sink. He built it out of a pine, assembled it with wooden pegs instead of nails, and then used a router to round all of the edges and corners. The itty-bitty drain, strainer, and stopper, I found at Marine (our hardware store) for $14. I am so incredibly proud of this gift we’re giving Nora and so, so thankful for the wonderful generosity of our friends and neighbors who made this possible. Something like this would probably cost hundreds of dollars, but I spent much, much less. 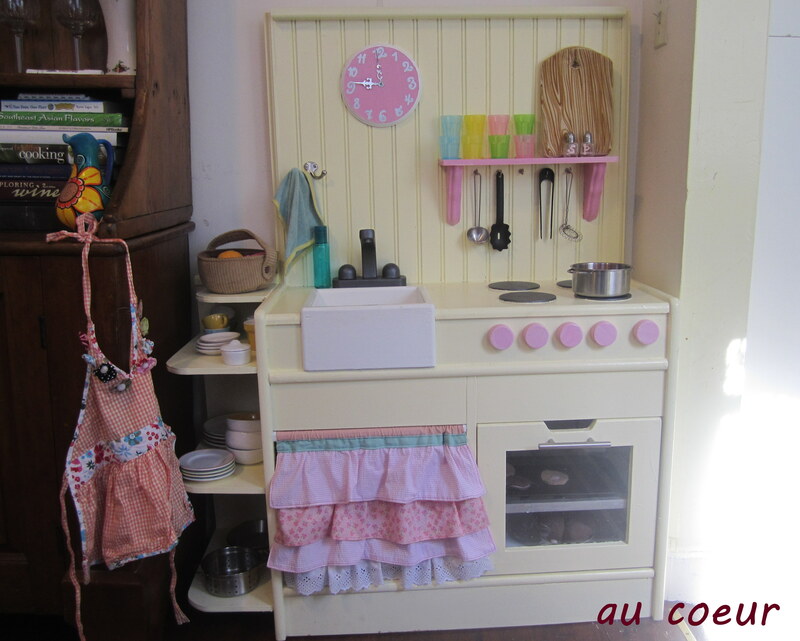 Here are the details: The play kitchen and all of the wood were given to me for free. The oven rack is part of a bed side rail that someone gave me when we took the side off Nora’s crib. It was too big because it was meant for a twin, so I cut it in half and saved the other half “just in case”. I spray painted it silver, which cost $4. All of the other paint we already had leftover from other things; I just bought a few painting supplies for under $10. 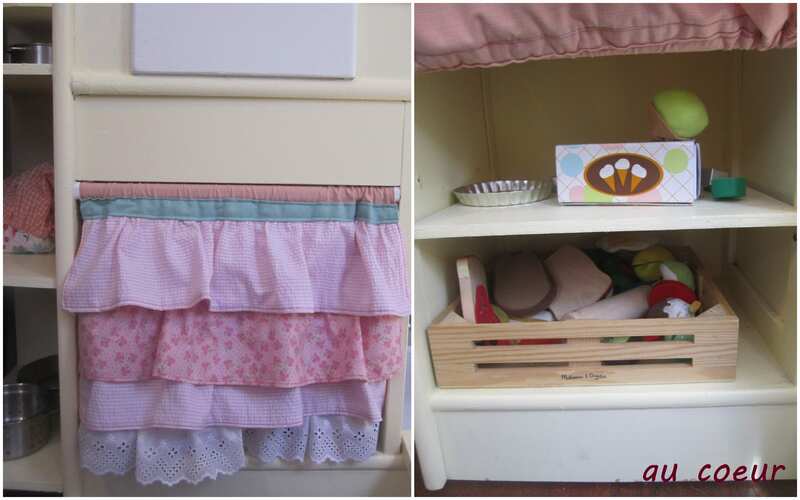 I bought the oven handle ($8), hooks ($7 total), corbels ($15), clock arms ($1.50), wooden circle ($5) and fabric (the most expensive part…about $20) for the curtain (details here). When it all came together, we built Nora a beautiful, one-of-a-kind, upcycled play kitchen for less than $75! I couldn’t be more thrilled with how this turned out, and Nora is pretty excited too… Especially once she discovered that she could give Baby Lulu a bath in the sink! I know Nora is going to get many good years out of this and, someday, I hope to see my grandchildren playing with it too. BEAUTIFUL Amber!!!!! You are an amazing mother and Nora is a lucky little girl. You should be so proud of yourself! Have fun!!! Amazing! You gave price breakdown…time? Well, it took a couple of months for me to track down all of the free wood and find time with Tiago to actually build it. That afternoon, he spent a little over three hours doing the initial work. I didn’t have the right wood for the sink, so he found that wood and built it at work (not sure how long it took), plus about 45 minutes to an hour for him to do final carpentry and for me to add details like the hooks, etc. Then there was painting (multiple coats)…all in all it is something that could be done in a day, but we did not. There were also a few things that took longer because of the fact that we were working with freebies instead of buying the right pieces (like having to piece together the bead board). I love it! I wanna play with it myself! Oh, that is so, so lovely. Truly one of a kind. What a great idea to do the bead board backing, and the shelves. And Tiago did a beautiful job on the sink. And the sink skirt gives it a real flourish. Incredible and beautiful! It’s gorgeous to look at (and Nora’s pretty darn cute, too :-). The finished product is wonderful. Nora will love playing with it. 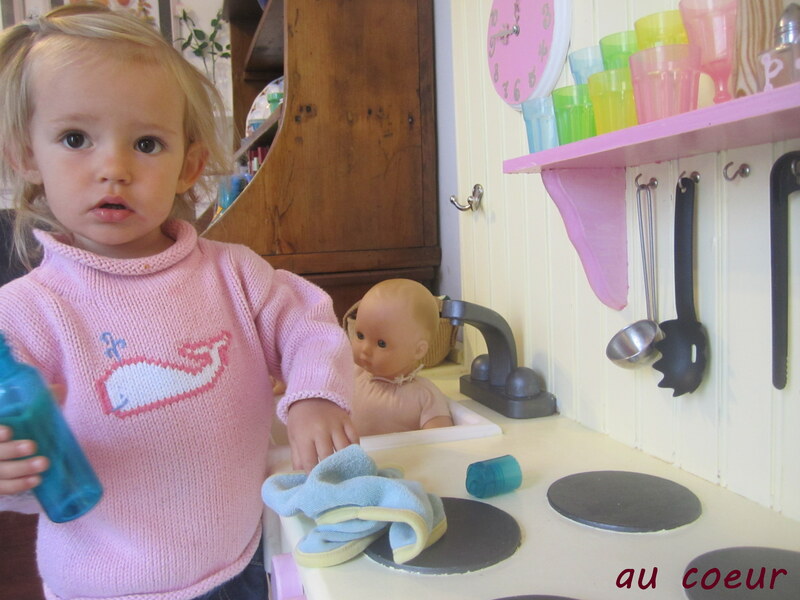 I do have to comment that you did have a play kitchen – it was a Little Tykes with all of the necessary accessories. In fact the kitchen was in your bedroom. You and your brothers spent quite a bit of time playing with it. Wow, I don’t remember that at all! All I remember was coveting those of my elementary school friends (remember Amanda Farley’s?). Thanks for the correction, Mom. It must have been sold/gotten rid of when we moved out of the Berry Drive house? No you had it at the Norwood House. Your bedroom was much smaller at the Norwood House. After awhile the American Girl dolls and their things took over your bedroom. The kitchen moved to the family room downstairs. I probably sold it before we moved into Tanager, since you were in middle school by then. I have photos of you and Brandon playing with your pink tea set on the kitchen peninsula. He has the white wicker rocker pulled up to the end and you are serving him tea. The pink tea set is out in our garage in one of your plastic tubs. I am saving it for Nora to play with when you, Chris, and Nora come to visit. Hi! I found this blog post through Pinterest. I recently bought the same kitchen set for my daughter off of Craigslist and I’m planning on sprucing it up a bit before giving it to her as a Christmas present. I was just wondering what kind of paint you used on yours. I noticed that the kitchen set has a bit of a glossy appearance. I’m really, really hoping I don’t have to sand before painting! How is yours holding up? Thanks! To be honest, I’m not sure what the paint was that I used — it was a leftover can from when our landlord painted the kitchen. I know it wasn’t low-VOC or anything special like I might have purchased if I wasn’t trying to keep the expenditures so low. I might have roughed it up slightly by hand with sandpaper (can’t remember) but I definitely didn’t do any extensive sanding. It got 2-3 coats of the paint and plenty of time to cure before she played with it, and a year and a half later we haven’t had any chipping, peeling or dings. Hope that helps, good luck with your kitchen! Thanks! Yours is so adorable! Soooo cute! Did you use a brush or spray machine to paint this? Also did you have to remove the knobs and doors to paints? Thanks!! I removed the faucet and knobs to paint. The oven door can’t be removed, so it stayed on. The paint was rolled on with a brush used in the corners/edges. Thank you for taking the time to respond! I forgot to ask if you used primer? We found the same kitchen as you and I am a little nervous to attempt my remodel. This would be my first major project and I don’t want to mess up 🙂 You guys did such a great job! Nope, no primer. We were going cheap and just using leftover paint. I didn’t sand either, and 2 years later it still looks as good as the day I painted it. This is really cute! I have the same kitchen that I got at a garage sale and have never liked the red in my turquoise play room. Did you just paint while it was still put together or did you have to disassemble it first? Also, what the heck brand is it?? I’m trying to buy the fridge that goes with it but can’t find the name to even search for it. Great work! Hi Ellen, I painted it without taking it the main structure apart, but did remove the knobs and faucet. The inside was tricky to pain assembled, but the outside turned out great. I don’t remember anymore what brand it is, but I do remember that I did a Google image search and eventually figured it out. Good luck! I just came across the brand name while searching for other pieces – it’s called ‘Plan Toys Kitchen’. HTH! Hi Amber, I have the same response as previous posters. 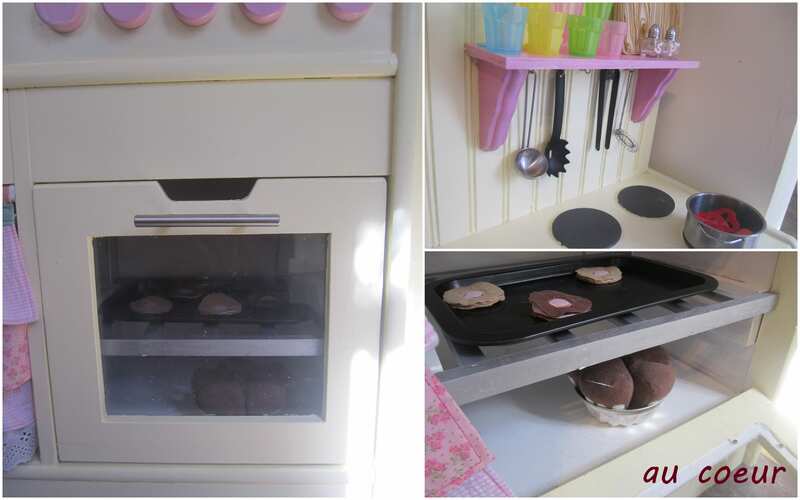 Purchased the same kitchen at a garage sale – it’s been sitting in my garage for months – going to give it a makeover for my girls Christmas present – yours turned out beautiful! My question: What did you use for the clear panel on the oven door? Plexiglass? Did you just glue it into the inside? Hi Amanda, the kitchen I started with already had the oven window. It is screwed in and I’m guessing it is plexi-glass? Whatever it is is very sturdy, because my girls regularly stand on it. Ah, darn. Mine is painted wood – must have been a modification by the previous owner. I’ll screw in a piece of plexi and see how long that lasts. 😉 Thanks for your response! …Back to the cold shop for more painting….